﻿Outsourcing ﻿has ﻿been ﻿an ﻿ever ﻿increasing ﻿trend ﻿for ﻿many ﻿years ﻿now, ﻿and ﻿accelerating ﻿with ﻿the ﻿new, ﻿evolved ﻿term ﻿for ﻿it, ﻿“the ﻿CLOUD”. ﻿OK ﻿so ﻿there ﻿is ﻿a ﻿lot ﻿of ﻿new ﻿capabilities ﻿in ﻿cloud ﻿computing ﻿over ﻿traditional ﻿outsourcing, ﻿but ﻿that ﻿does ﻿not ﻿fundamentally ﻿alter ﻿the ﻿functional ﻿activity ﻿of ﻿outsourcing. ﻿This ﻿outsourcing ﻿trend ﻿has ﻿been ﻿accompanied ﻿by ﻿an ﻿increasing ﻿number ﻿of ﻿IN-sourcing ﻿efforts; ﻿where ﻿outsourcing ﻿has ﻿proven, ﻿in ﻿some ﻿instance, ﻿to ﻿be ﻿a ﻿poor ﻿choice. ﻿Companies ﻿are ﻿discovering ﻿that ﻿their ﻿decision ﻿process ﻿may ﻿have ﻿been ﻿flawed, ﻿and ﻿some ﻿of ﻿the ﻿longer ﻿term ﻿implications ﻿of ﻿outsourcing ﻿were ﻿not ﻿considered ﻿in ﻿the ﻿decision ﻿process, ﻿tying ﻿the ﻿hands ﻿of ﻿the ﻿company ﻿in ﻿being ﻿able ﻿to ﻿effectively ﻿leverage ﻿new ﻿technological ﻿capabilities. ﻿So ﻿how ﻿do ﻿we ﻿pick ﻿what ﻿should ﻿stay ﻿and ﻿what ﻿should ﻿go? ﻿Let’s ﻿step ﻿back ﻿and ﻿look ﻿at ﻿a ﻿framework ﻿for ﻿making ﻿those ﻿decisions ﻿that ﻿may ﻿prove ﻿useful. ﻿In ﻿any ﻿IT ﻿effort, ﻿there ﻿is ﻿a ﻿product ﻿life ﻿cycle. ﻿In ﻿that ﻿cycle ﻿there ﻿are ﻿2 ﻿major ﻿blocks; ﻿non-recurring ﻿and ﻿recurring ﻿activity. 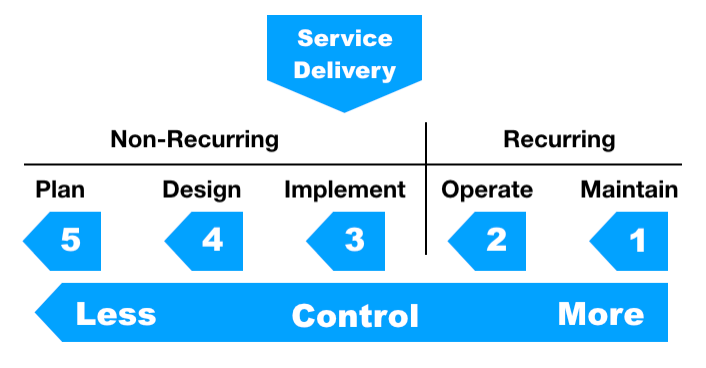 ﻿In ﻿non-recurring ﻿activity, ﻿there ﻿are ﻿3 ﻿major ﻿steps; ﻿Plan, ﻿Design, ﻿and ﻿Implement. ﻿In ﻿recurring ﻿activity, ﻿there ﻿are ﻿2; ﻿operate ﻿and ﻿maintain. 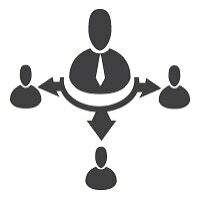 ﻿Using ﻿this ﻿basic ﻿model, ﻿outsourcing ﻿would ﻿start ﻿at ﻿the ﻿far ﻿right ﻿side ﻿with ﻿maintain, ﻿as ﻿the ﻿first ﻿aspect ﻿you ﻿would ﻿outsource. ﻿As ﻿you ﻿move ﻿more ﻿to ﻿the ﻿left, ﻿you ﻿give ﻿up ﻿more ﻿control ﻿over ﻿the ﻿result, ﻿and ﻿of ﻿your ﻿future ﻿where ﻿the ﻿components ﻿being ﻿outsourced ﻿are ﻿concerned. ﻿What ﻿companies ﻿are ﻿discovering ﻿is ﻿that ﻿commodity ﻿IT ﻿services, ﻿can ﻿have ﻿levels ﻿1-5 ﻿all ﻿outsourced, ﻿with ﻿little ﻿impact, ﻿whereas ﻿key ﻿systems ﻿that ﻿provide ﻿competitive ﻿advantage ﻿and ﻿market ﻿differentiation, ﻿or ﻿technologies ﻿that ﻿are ﻿subject ﻿to ﻿high ﻿velocity ﻿change, ﻿should ﻿have ﻿far ﻿fewer ﻿- ﻿or ﻿even ﻿none ﻿- ﻿of ﻿the ﻿level ﻿1-5 ﻿steps ﻿outsourced. ﻿Understanding ﻿the ﻿business ﻿value ﻿of ﻿the ﻿systems ﻿in ﻿question, ﻿is ﻿key ﻿to ﻿this ﻿decision ﻿process, ﻿and ﻿this ﻿simple ﻿frameworks ﻿helps ﻿with ﻿understanding ﻿the ﻿impacts. ﻿If ﻿you ﻿are ﻿outsourcing ﻿something ﻿in ﻿the ﻿middle ﻿- ﻿say ﻿implementation ﻿- ﻿it ﻿is ﻿not ﻿truly ﻿an ﻿outsourcing ﻿effort, ﻿but ﻿a ﻿service ﻿delivery ﻿function ﻿that ﻿is ﻿being ﻿outsourced, ﻿most ﻿often ﻿as ﻿a ﻿project ﻿based ﻿non-recurring ﻿activity.